And so it has come to pass: in the face of rising unemployment, record levels of emigration and a widening gender education gap the Government has decided to make it even more expensive to employ young men. Make no mistake about it: the minimum wage is a tax on young men, especially those with low/no skills. It is young men who are more likely to be unemployed (we have the highest gender unemployment gap in Europe - see latest Eurostat pdf), while young men are more likely to leave school and not progress to third level. They are also more likely to emigrate. In other words, it is young men who are on the margins of the labour market, and whose employability is more determined by the cost of hiring them than just about any other group of potential employees. Unfortunately the Left has more or less abandoned young men as a group. Hence their ludicrous defence of a high and rising minimum wage. 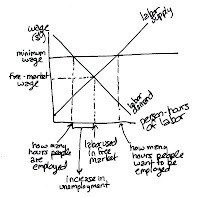 Apparently a high minimum wage is good because it boosts aggregate demand in the economy. But the odd thing is they never take their argument to its logical conclusion: why not raise the minimum wage to €50 an hour if its macro-economic benefits are so obvious? 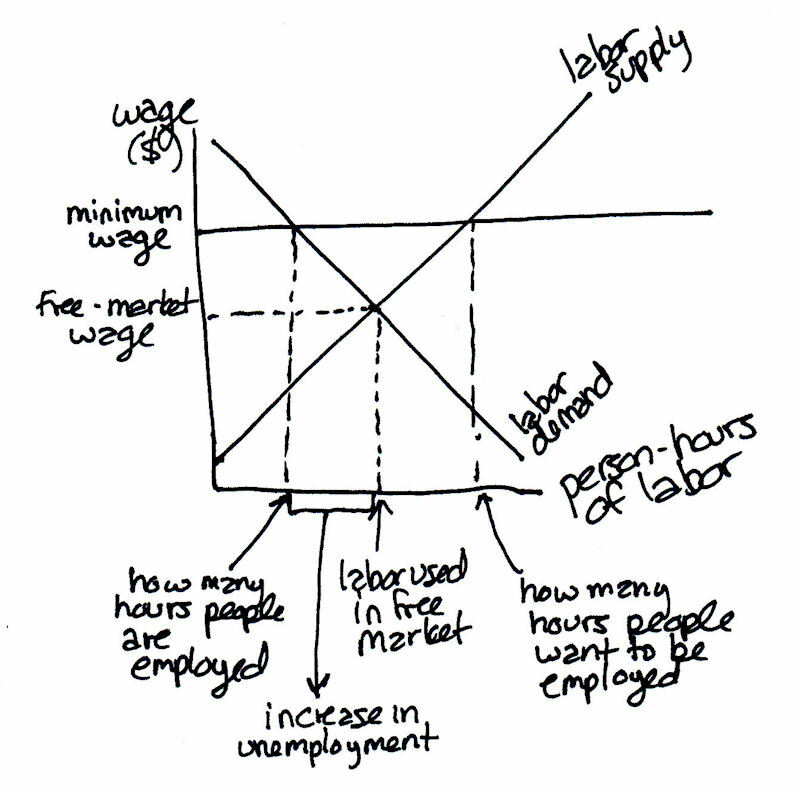 The reality is that employers don't hire unskilled, inexperienced staff on the basis of aggregate demand assumptions. They hire them on the basis of micro-economic assumptions about affordability and productivity. Increasing the minimum wage increases the risk an employer takes in incurring the cost of additional staff. And right now employers are a risk-averse lot. I was going to add 'obviously' only it doesn't seem that obvious to the powers-that-be. Lost job opportunities for young people are especially unfortunate given that entry-level jobs, which generally pay the minimum wage, are a stepping stone to better paid employment. These jobs enable workers to develop skills and gain experience that ultimately lead to higher productivity and wages. In fact, research shows that after one year, more than 60 per cent of minimum wage workers earn more, with a typical wage gain of about 20 per cent. After two years, the percentage of workers earning more than the minimum wage increases to more than 80 per cent. I suggest an alternative solution. Simply remove all regulations in relation to wage rates (and other taxes on labour such as employers' PRSI) in the economy for a period of, say, three years. If at any time in that period the unemployment rate falls below 10% then restore the regulations if that's what the electorate wants. But in the meantime stop the tax on young men. About six months ago, on I think the Late Late Show, Edwina Currie proposed that the minimum wage be suspended altogether in order to boost employment opportunities. Fine Gael not only ignored her but have crassly increased the minimum wage - with the inevitable malign effects you describe. Moreover, it is not just low-skilled workers that Fine Gael are pricing out of a job. Thousands of higher paid jobs are linked, whether formally or informally, to the minimum wage so expect that their payrates will likewise increase as well, and so squeeze even more people out of employment. Why do Fine Gael despise Irish citizens so much? 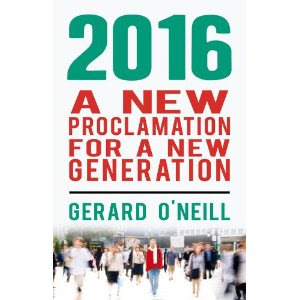 I agree that there should be no taxes on labour, Gerard. It's ludicrous at a time of high unemployment to be penalising employers for hiring people. However, I'm not so sure about the link between young-male unemployment and the present level of the minimum wage. Another way of looking at is to see the minimum wage as an equalising tool between native Irish labour and foreign workers, who would most certainly work for less money than any Irish native could afford to. If there are no controls on immigrant labour apart from the wage rate that's available, then the wage rate must be regulated at it's base level, where the competition between native and immigrant labour will be at its most intense, and where the risk of exploitation will be highest. I don't know the details, but it is often forgotten that, for very young people, the minimum wage is actually lower than the €7.65 normally quoted. I think more emphasis needs to be placed on the fact that for many young men, it's not labour costs but a lack of skills that's making them unemployable. How many men left school early during the boom time on a promise of earning heaps of cash as a tradesmen, only for the construction/housing industry to implode in on top of them? They're left with skills nobody wants, and often missing third-level or even post junior cert qualifications. I work as a software developer, and IT is one of the only sectors in the Irish economy that has grown year on year throughout the recession, but the government have utterly failed to promote it as a career, vis-a-vis the dept. of trade and employment and the dept. of education.